Home » Stonehenge Guided Tours » Before Stonehenge – did this man lord it over Wiltshire’s sacred landscape? Before Stonehenge – did this man lord it over Wiltshire’s sacred landscape? arguably the most accurate, reconstruction of a specific individual’s face from British prehistory. Five and a half millennia ago, he was almost certainly a very prominent and powerful individual – and he is about to be thrust into the limelight once again. For his is the prehistoric face that will welcome literally millions of visitors from around the world to English Heritage’s new Stonehenge visitor centre after it opens tomorrow, Wednesday. The organisation estimates that around 1.2 million tourists from dozens of countries will ‘meet’ him as they explore the new visitor centre over the next 12 months. The new scientific research has revealed, to an unprecedented degree, who this ‘face of prehistory’ really was. Aged two, he was taken east, presumably by his parents, to an area of chalk geology – probably Wiltshire (around the area that would, 500 years later, become the site of early Stonehenge). However, aged 9, he then moved back to the west (potentially to the area where he had been born) – and then, aged 11, he moved back east once more (again, potentially to the Stonehenge area). By analysing nitrogen isotope levels in his teeth, a scientific team at the University of Southampton, led by archaeologist Dr Alistair Pike, have worked out that he obtained 80-90% of his protein from animals – probably mainly cattle, sheep and deer. 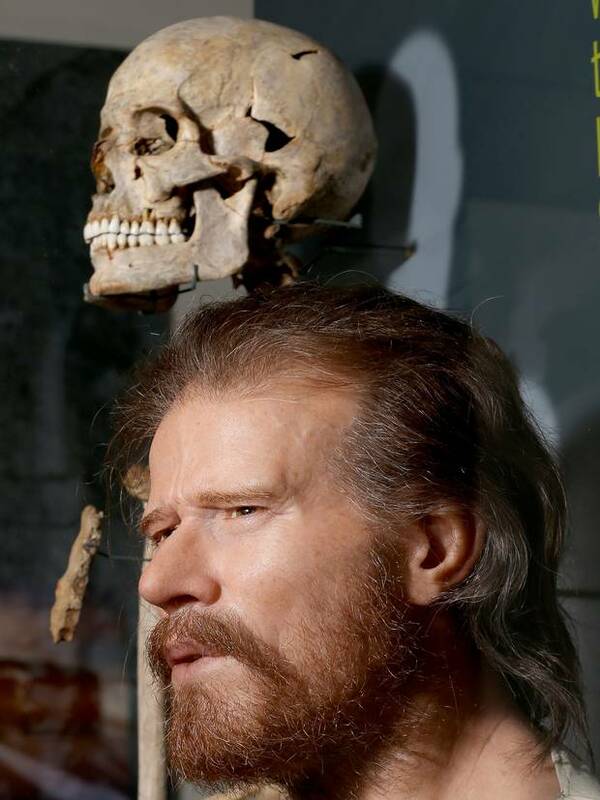 A detailed osteological examination of his skeleton, carried out by English Heritage scientist, Dr Simon Mays, has revealed that he probably led a relatively peaceful life. The only visible injuries showed that he had damaged a knee ligament and torn a back thigh muscle – both injuries, potentially sustained at the same time, that would have put him out of action for no more than a few weeks. There is also no evidence of severe illness – and an examination of hypoplasia (tooth enamel deformation) levels suggest that at least his childhood was free of nutritional stress or severe disease. Hypoplasia provides a record of stress through a person’s childhood and early teenage years. However, he was probably given an impressive funeral – and certainly buried in a ritually very important location. Initially his body was almost certainly covered by a turf mound but some years or decades later, this mound was massively enlarged to form a very substantial mausoleum – one of the grandest known from Neolithic Britain. He was the only individual buried there during his era – although a thousand or more years later, several more people were interred in less prominent locations within the monument. This great mausoleum – 83 metres long and several metres high – was treated with substantial respect throughout most of prehistory – and can still be seen today some one and half miles west of Stonehenge. Fifteen hundred years after his death, his tomb became the key monument in a new cemetery for the Stonehenge elites of the early Bronze Age. All the new evidence combines to suggest that he was a very important individual – a prominent member of the early Neolithic elite. Of the 350 such long barrows known in Britain, it is estimated that 50% had no burials in them at all, that a further 25% had just one person buried in them – and that most of the remaining quarter had between five and 15 buried in each of them. Secondly, it shows, arguably for the first time, that high social status in the early Neolithic was already a matter of heredity. The isotopic tests on the man’s teeth show quite clearly that his privileged high meat diet was already a key feature in his life during childhood. Most tantalizing of all, is the newly revealed likely link between Wales and the pre-Stonehenge ritual landscape. When the first phase of Stonehenge itself was finally built in around 3000 BC, the stones that were probably erected there were not, at that stage, the great sarsens which dominate the site today, but were probably the much smaller so-called ‘bluestones’ (some of which are still there). Significantly, it is known from geological analysis that those bluestones originally came from south-west Wales – and were therefore almost certainly brought from there to Stonehenge by Neolithic Britons. Indeed, as late as the 12th century AD, the Anglo-Norman chronicler, Geoffrey of Monmouth, wrote down an ancient legend also suggesting that the stones had come from the west (albeit, in his account, from Ireland, rather than Wales). Archaeologists will now be investigating whether the Stonehenge landscape’s link with Wales was in reality even older than that first phase of the monument. In that sense it is spookily relevant that the mid-fourth millennium BC man chosen by English Heritage to be the ‘face of the Neolithic’ may actually have been a key part of the original cultural process which ultimately, five centuries later, led to early Stonehenge being erected. By StonehengeNews in Stonehenge Guided Tours on December 17, 2013 .